Last summer we made a vow to get out of the city more and spend more time in nature. Even though the Midwest doesn’t have the scenery of a Colorado or an Oregon, there are still plenty of places to camp near Chicago that will help you reconnect with nature. There are great locations in Michigan, Indiana, Wisconsin and even Illinois that are a two-hour drive or less and have great trails and campsites for a night or two away. To add to our excitement for this year’s camping season we both just ordered new sleeping bags! We’re planning a trip to Michigan’s Upper Peninsula this year for a three-day, two-night trip and a long weekend at Devil’s Lake State Park in Wisconsin. One of my favorite things about camping is disconnecting from technology and social media. 90% of the time, service is limited at campgrounds and WiFi isn’t available. By eliminating distractions, it is so much easier to connect with nature and those around you. As long as I come prepared to battle my natural allergies, I often get great sleep while camping as all the honking and sirens of city life are far, far away. We tend to go to bed earlier and wake up shortly after the sun rises, without an alarm screaming at us to start the day. There’s something comforting and relaxing about sitting around a campfire slowly getting drowsy as the wood burns down. All three of the following campsites allow for car camping, which is a nice way to ease into the camping lifestyle. The below campsites all have the option for electricity so you can plug in a fan and/or blow up an air mattress. This year we may add to our gear collection and add true sleeping mats, but an old air mattress is also an easy way to go, just make sure it will fit in your tent! Did you know that you can find canyons and waterfalls in Illinois?!? Well you can if you travel about two-hours Southwest of Chicago to Starved Rock State Park which rests right on the Illinois River. Illinois’ favorite wilderness area boasts 18 canyons and more than 13 miles of trails where you can hike, camp, fish or hunt throughout the year. Last May we visited Starved Rock over Memorial Day weekend and because we’d had nothing but rain the first half of May, the waterfalls in the canyons of Starved Rock were going strong. Our favorite waterfall of the trip was in Ottawa Canyon. We also enjoyed hiking in nearby Matthiessen State Park, which had some strenuous, and very muddy, trails along the Illinois River. Because we made a last-minute decision to camp over Memorial Day weekend, all of the campsites in the state parks were already booked, but I found a great little campsite a couple of miles away that was nestled into the cornfields. Pleasant Creek Campground is a great little campground that is suitable for both tent and RV camping with clean bathroom facilities and a store to pick up your firewood. If you don’t have a camping stove (we didn’t at the time), it’s easy to build a campfire and throw on some foil packs. Both Jeremy and I grew up making foil packs at our overnight camp, Camp Sabra, and we’re always excited to eat one of our favorite nostalgic meals prepared just like we did back in the ‘90s! We even made banana boats to finish off the meal. On one side of our tent was a couple around our age with their two dogs and the other side had a family with two young boys, so it’s really suitable for all ages. There is even a game room with a few arcade games, air hockey, foosball and more to entice older kids and teens to join the trip. I definitely recommend this site for people who can’t camp directly in Starved Rock or Matthiessen State Parks. Also for a sweet treat for your ride home, don’t forget to stop and get breakfast and a pastry at Nonie’s Bakery and Café! Fullers Resort and Campground in the heart of Michigan wine country is really a hidden gem! 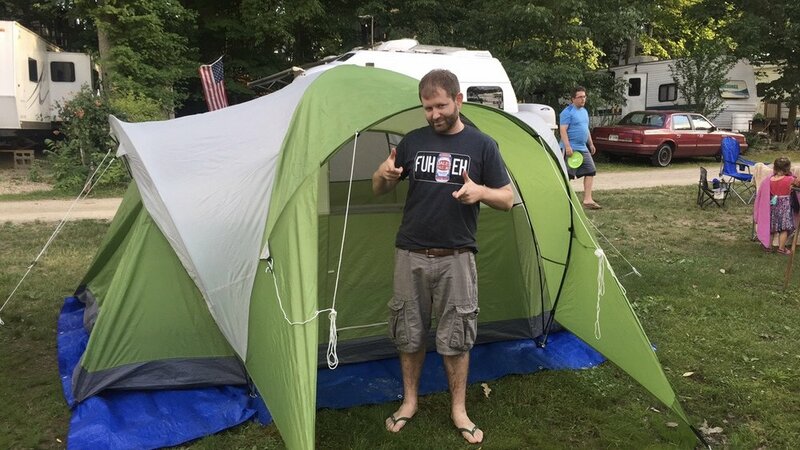 We decided to drive up to Michigan on a Saturday morning to check out a few wineries in the region and thought that it would be fun to camp for a night instead of driving back. I had googled some campsites in advance and this one seemed to have good ratings among the camping crowd, so we decided to pull up and see if they had room for us. This place was huge and had a large pond/beach area with sand volleyball and swimming, an on-site store, campfire karaoke in a barn and open fields for sports. It was kind of like a camping resort. After setting up our tent we discovered that there are a lot of seasonal sites with permanent RVs and trailer homes where people set-up for the whole summer season. Some of these places were seriously decked out with nice BBQs on professionally built porches, big screen TVs and rooms large enough to fit a king bed. We also discovered a site that was filled to the brim with lawn ornaments, haha. The rest of the campground is mixed tent/camper/RV camping for people who are just coming in for the weekend or a short stay. There was a really nice family whose site was next to ours and they ended up making way too many burgers and even insisted we eat with them! People always seem more open and giving when removed from the stress of city life! Now that we know about the campsite’s great facilities, we vowed to come back next summer and spend more time exploring the beach and taking a swim! The Warren Dunes in Michigan is one of the most iconic and sought-after campgrounds of the summer so you need to make reservations months in advance. I’m talking like, make one now and you might get a tent site in August! This site is nestled in the middle of the Michigan’s Warren Dunes State Park and it’s just a short drive or a nice 1.5 mile hike to the dunes and the beach, making the campground a perfect home base. I’ve been to this campground a couple of times and have never been disappointed. It can be noisier and more crowded than some of the private campgrounds I listed above, but the location is ideal. Do take note that it doesn’t allow alcohol, so if you’re into having beers around the campfire you’ll need to be sneaky. The bathroom facilities here are clean and an easy walk to wherever you are on the grounds. One of the best activities to do here is to hike up to the top of the dunes for sunset. With the lake to the west while you’re in Michigan you get to see a beautiful sunset over the water. During the day the beach is the place to be. Since it’s a public beach anyone can visit for a small fee (given to the state park), but that means that there are clean bathroom facilities, a small fast-food restaurant and activities for kids. The beach itself is also really nice and it’s quite common to see families taking a dip in the water to cool off on a hot summer day.